On Sunday afternoon we sang a short set at the pre-Evensong concert at St. James Cathedral. The songs were from Harmonia Sacra, published by Henry Playford from 1688 and later expanded editions. It has all the Purcell sacred hits including the above and the Blessed Virgin's Expostulation etc. It would have been for domestic use; to sing at home on Sunday when you are feeling pious and penitent, after singing his booze and fart joke catches on Saturday night. We did some John Blow on the concert too. 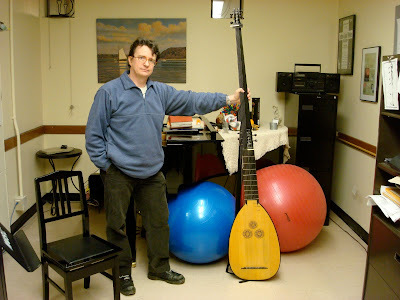 I played it on the theorbo. Here's a pic of that taken by Darryl Edwards (no relation).